The 'Sea Hunter' could revolutionize shipping for both the military and commercial interests. 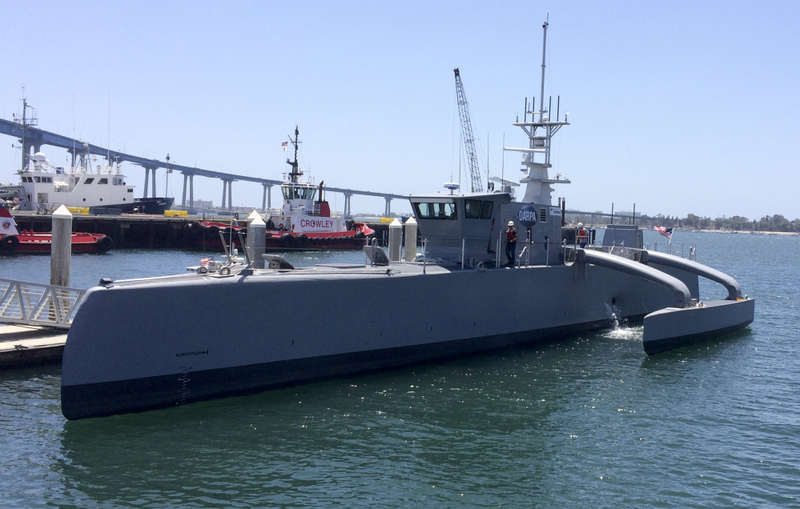 SAN DIEGO — The military is launching tests on the world’s largest unmanned surface vessel – a self-driving, 132-foot ship designed to travel thousands of miles out at sea without a single crew member on board. The so-called “Sea Hunter” has the potential to revolutionize not only the military’s maritime operations but commercial shipping, according to military officials. If successful, it could usher in the arrival of unmanned cargo vessels moving between countries. Military officials showed off the ship in San Diego on Monday before it set sail to a nearby Naval base where the testing will be conducted. The sleek, futuristic-looking steel-gray vessel was docked at a maritime terminal in the heart of San Diego’s shipbuilding district, where TV crews filmed the robotic craft. No media access was given to the inside of the vessel. The Pentagon’s research arm, the Defense Advanced Research Projects Agency, or DARPA, developed the ship along with Virginia-based Leidos. DARPA will test it in conjunction with the Navy over the next two years off California’s coast. The tests will largely focus on its ability to react on its own to avoid collisions with seafaring traffic. “For our military operations we want to make sure we have unmanned vessels like this to supplement the human mission so that we’re not putting people unduly in harm’s way,” said DARPA spokesman Jared B. Adams. During the testing phase, the ship will have human operators as a safety net, but once it proves to be reliable, the autonomous surface vessel will maneuver itself – able to go out at sea for months at a time. Program manager Scott Littlefield said there will be no “remote-controlled driving of the vessel.” Instead it will be given its mission-level commands telling it where to go and what to accomplish and then software will enable it to drive itself safely. The military initially built the diesel-powered ship to detect stealthy diesel-electric submarines, but developers say they believe it has the capability to go beyond that, including detecting mines. There are no plans at this point to arm it. Some see the possibility that the full-size prototype could pave the way to developing crewless cargo vessels for the commercial shipping industry someday, he added. Countries from Europe to Asia have been looking into developing fleets of unmanned ships to cut down on operating costs but the idea has sparked debate over whether it’s possible to make robotic boats safe enough to run on their own far from land. The “Sea Hunter” was built off the Oregon coast, and moved on a barge to San Diego’s coastline. The prototype can travel at a speed of up to about 30 mph. The program to develop the ship cost $120 million, though DARPA officials say the vessels can be produced for about $20 million. During the collision tests, the ship will be programed to follow international traffic rules for traditional boats of its size.